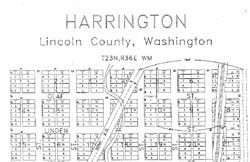 Harrington, in Lincoln county Washington, is 46 miles west of Spokane, Washington and 190 miles east of Seattle, Washington. 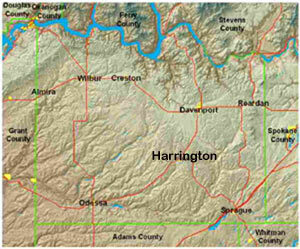 Harrington is located at the intersection of State Routes 28 and 23, a pleasant 20 minute drive north of Interstate 90 and only 13 minutes south of it's nearest neighbor, Davenport on State Route 2. 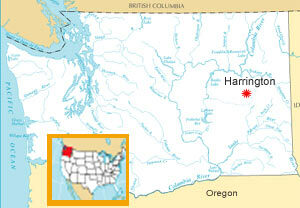 The city was incorporated in 1902 and has a population of approximately 415.